Skegness Town returned back to winning ways with a narrow victory over East Lindsey rivals CGB Humbertherm in the Supplementary Cup at Burgh Road. Lilywhites boss Nick Chapman was forced to make half a dozen changes because of injury and unavailability, but those who stepped into the breach helped secure three Group B points for the seasiders. Ben Drysdale, Andy Parish, Michael Hardy, Miles Chamberlain, Jamie Epton and McCauley Parker were all unavailable going into this cup game. Ben Davison dropped into defence, Michael Parnham took over the left back berth and Dan Field slotted into the midfield alongside Josh Bartlett. Their opponents were bolstered by the demise of Louth Town’s Lincolnshire League presence, with Callum Hyland and Carl Martin in their starting 11. For the first 20 minutes there was some neat passing football from both sides, but each cancelled the other out and there were very few chances created. A Davison header went just over and Jordan Smith powered a shot inches wide of the target. The home defence dealt with all that was thrown at them in the early stages and the Therm failed to test Jack Solomon in Town’s goal. After a goalless first half, the game continued along a similar pattern, although the Lilywhites looked the most likely to break the deadlock. They scored the all important goal midway through the second period after the visitors only half cleared a set piece. The ball was lifted back into the area where Liam Parker was on hand to slot past the keeper. Skegness Town: Solomon, Warren, Parnham, Field, Davison, Parker, Smith, Bartlett, Britton, Veall, Rayner-Mistry. 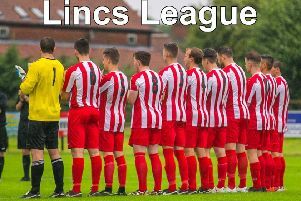 On Saturday, Skegness return to league action when they travel to Lincoln Railway AFC. The Lilywhites will be without Davison, McCauley and Liam Parker and Josh Bartlett. Andy Parish is likely to be out for a month with a knee injury, but Miles Chamberlain is expected to return to the squad.